UPDATE: Over at my links blog I shared the really cool Photoshop technique I used on this picture. Have you been cooking a lot with wine? Did your church have an exceptionally large congregation to serve the Eucharist to? Now you’ve got me curious! Do we get words to go with the image on Thursday? Or is it a more obvious picture and my lightbulbs just aren’t turning on today? Is someone a wine nerd, too? I thought the unspoken message was “we drink a lot of wine”. 🙂 We’ve been saving our corks for like five years now and have a big basket full of them. Oh – and to Blog Nerd’s question – yes. Although recently I’ve discovered the beauty of boxed wine — it’s great since we usually just have one glass each with dinner and were wasting some of our bottles. We love “Box Star” merlot. Also, amazingly, Target (yes, *that* Target) has an excellent box of Chardonnay (we discovered it through the Wall St. Journal, whose wine writer recommended it highly). I’m going to shut up about boxed wine now. Thanks for visitng Jennifer, I will have it posted by friday night. Happy feast of All Saints and souls. Wow! This is a cool photo. It looks professional like something you’d see in Food and Wine magazine or some other such publication. That Nobilo cork at the top… surely a Kiwi wine? Next to bread, only wine becomes God, and I’m becoming somewhat of a wine nerd myself. Two weeks ago I went on my second annual “pilgrimage” to the wine country of Napa & Sonoma. They were at 70% of the harvest, and nothing compares to being able to sample grapes as part of the respective tours. This year’s trek was mostly Sonoma and I visited eight wineries in two days: Artesa, Robledo Family, Ravenswood, Gundlach-Bundshu, Imagery, St. Francis, Ledson & Blackstone. Next year will be the Silverado Trail in Napa County. Got mine last Friday and boy, does it make a difference! It really smoothed out the boxed 2006 Banrock Station Cabernet Sauvignon I got at the local Whole Foods Market. It’s a young Cab – and quite tannic but Vinturi really smoothed it out and opened it up. Can’t wait to try it on Banrock’s boxed Shiraz, Merlot & Chardonnay. Love it! We have a LARGE bowl of wine corks gracing our table…and a another on the kitchen counter…and two wreaths I covered in corks…and a bulletin board – made with used wine corks….and a grocery bag of old wine bottle corks. 🙂 Hahahaha! I’m always afraid we’ll get a bad rap, but I guess it is a well-deserved one. Have a blessed All Saints’ Day! I love it, Jen! 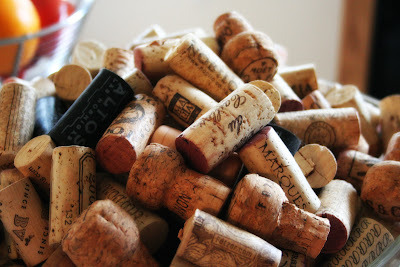 There’s something beautiful about corks. I never thought of saving ours. I’m with Terri. Very artsy, Jen! Happy Feast of All Saints today and Feast of All Souls tomorrow! Terri – Thanks! I used the first technique they talk about in this cool Photoshop tips post. I use it all the time and it always makes my pictures look so cool! Thank you all for your comments. Happy Feast of All Saints! Kiwi Nomad – yes! I LOOOOOVE wines from NZ, especially the Marlborough region.